Our new Cask Finished Gin, proudly adorned with a gold medal awarded at the San Francisco World Spirits Competition, is now available. 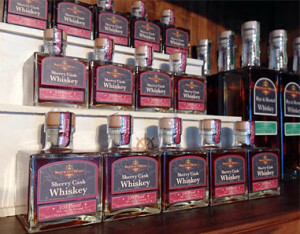 Thanks to the complexities of state and federal labeling requirements, we were able to enter this unique gin in competition before it was released. 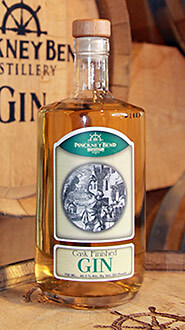 Pioneered by the Dutch 400 years ago, gin was transported in wooden barrels until the early 19th century. Crossing the English Channel from distillers in Holland to markets in London, gin could spend several months in contact with wood, where it picked up both color and flavor. Today, this old ‘cask finish’ style of gin has become new again. The basis of this expression is Pinckney Bend’s award winning American Gin, which is smooth on the pallet, with bright juniper and well-balanced citrus notes. It is then finished in charred, second use Missouri white oak barrels, which introduces a layer of complex wood flavors, a subtle vanilla-infused sweetness and the spice of young whiskey. Cask Finished Gin should begin working its way into retail channels by mid-July. If you don’t see it on your favorite retailers shelves, ask them to get it for you.